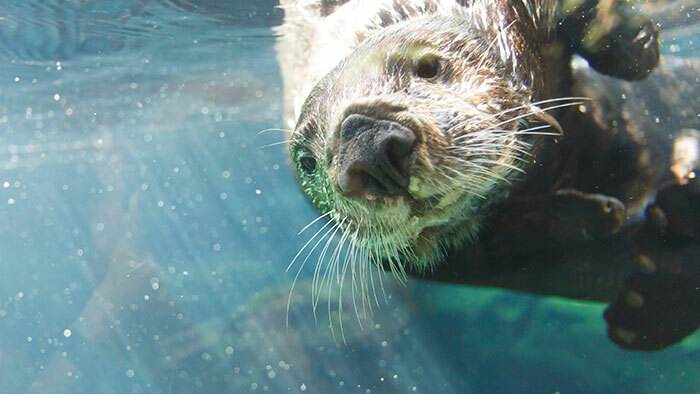 The Minnesota Zoo is home to three sea otters—Capers, Jasper, and Rocky. They were each found as orphaned pups in the wild and were cared for at the Alaska SeaLife Center before coming to Minnesota. Sea otters live in cold waters off the coasts of Russia and North America from Alaska to California. These marine mammals love seafood such as sea urchins, fish, clams, snails, worms, sea stars, crabs, squid, octopus, and abalone. How thick is a sea otter’s fur? Sea otters store food in cheek pouches. Sea otters can stay underwater for up to 5 minutes. Sea otters smash shellfish against rocks so they can get at the meal inside. Unlike other marine mammals, sea otters do not have blubber to keep warm. Instead they rely on their dense fur—as they groom their fur, air gets trapped under the fur and gets heated by the body to provide insulation. The tiny trapped air bubbles also gives otters a silvery appearance underwater. Sea otters eat 25-30% of their body weight each day in seafood. Download this activity sheet to see how that compares to how much food you eat every day.